We are the melting pot of the world. There are all sorts of people, and all sorts of tastes. That is great as we have all sorts of Memory and T-Shirt Quilt styles. Lets look at SOME of our best selling quilt styles. Bet one of them will be your favorite! 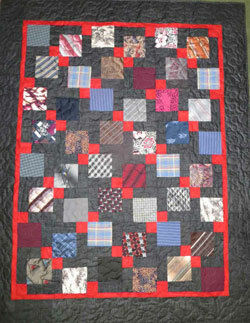 This is THE premier top of the line quilt on the web. This one is features our signature style of sashings, cornerstones and TWO borders. No one else offers that as the 'standard'. Optional features include a 3rd Accent Border and flannel backing upgrade. 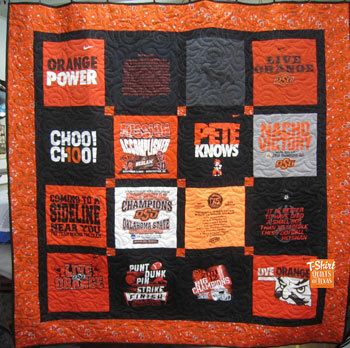 This quilt is made up entirely of Oklahoma State University tshirts. Collegiate fabrics highlight the outer border. With the 'no border' style, we eliminate the outermost border. The sashing (the part that touches each block) on the outside is enlarged just a bit, but is not as wide as the Traditional Style, and is more economical. Accent Borders are an option. Still professionally quilted and all the same great quality fabrics. Modern Style - aka "Sashings All Around". Another tshirt quilt with the sashings cornerstones that go all the way around with no outer border gives this tshirt quilt a more modern look. 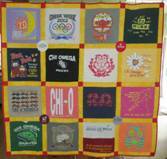 This tshirt quilt was made from Chi Omega sorority tees. When you only have a few tee shirts, we can still make a great quilt based on a very old quilt pattern called Carpenter Star. 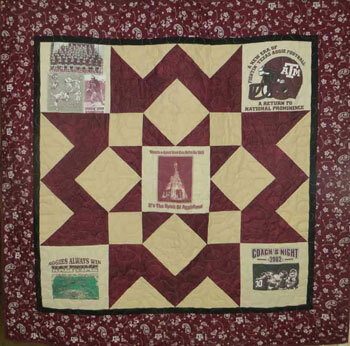 This Texas A&M quilt was made with five canvas bags and collegiate A&M fabric with an accent border in the school colors. Another option when you want a larger quilt, but don't have enough tee shirts. (I know, most of you have too many shirts!) We alternate the tee shirts with a tone-on-tone print that coordinates with the border print. Creates a checker-board effect, but a great way to double the size of the quilt. In this example, we added some extra logos and images from spare t-shirts. This quilt has several things going here. This memory quilt on the left) was made with mostly ties and a few shirts from a loved one that passed. Since the silk ties had so much color in them, we selected a black tone-on-tone print and a beautiful red for the cornerstones and accent border. The black print makes a secondary pinwheel design and the red add pops of color. The second quilt is the same pattern, but using regular quilting fabrics. it shows how different fabrics create a different look. For baby quilts, we put a piece of baby clothing in each of the larger squares, or just use juvinile prints for a great quilt. Two different versions of this quilt are available. One WITH the mortar, and without. 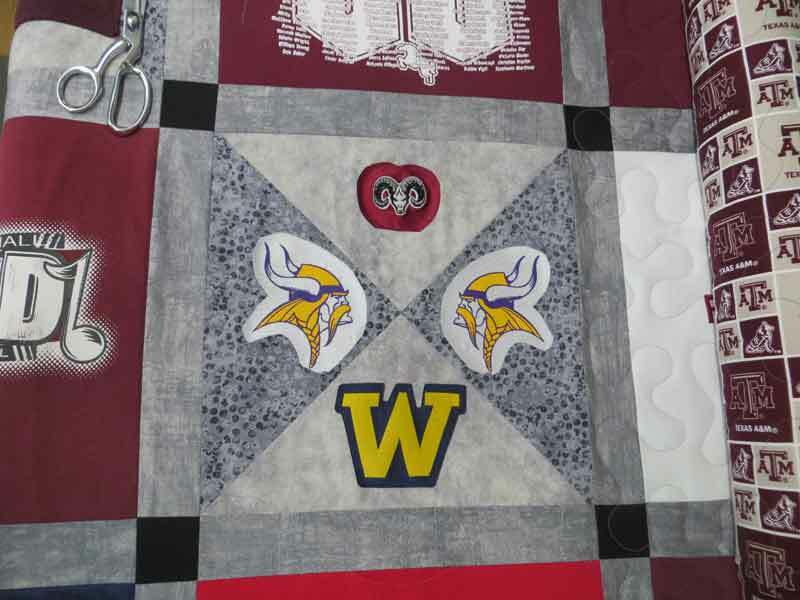 This is a popular style for Memorial or Bereavement Quilts, as it utilizes large pieces of your loved ones clothing. 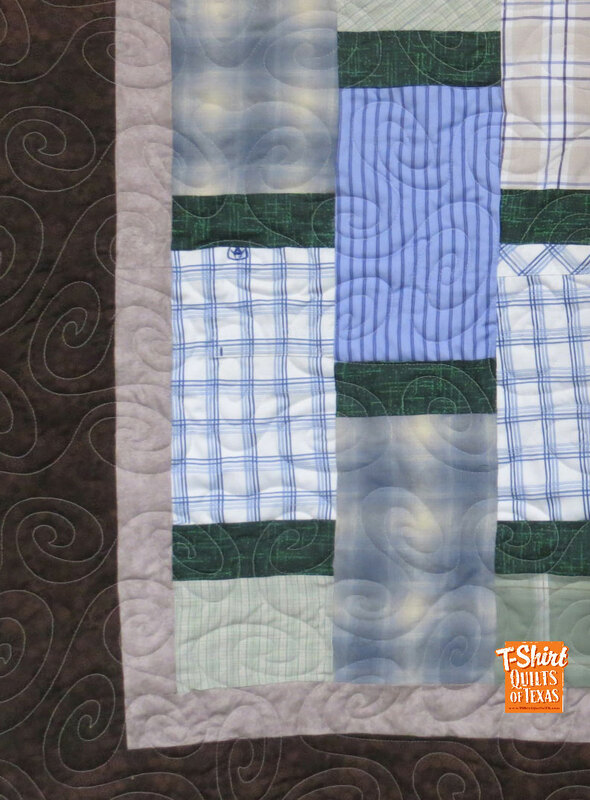 Plaid oxford shirts make into really pretty quilts. What about a red for the mortar*? What fun!!! We take a good portion of your onesies and toddler clothing and make a generous throw sized quilt with blocks that are anywhere from 5" to 7". The size of the blocks kinda depends on whether you are sending 'onesies' or toddler clothing. Whatever sized used, it still makes a great memory quilt. We usually use either 35 or 48 blocks and it includes the sashing, cornerstones, accent border and full border. 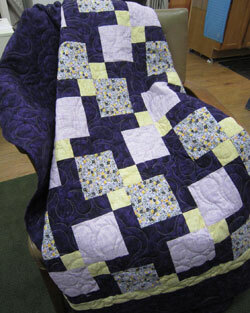 For more details and photos about baby quilts, click here. 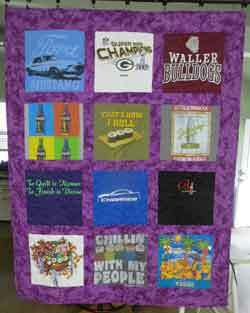 With all of these options, we can surely find a quilt that you would like to have created with your t-shirts. Check our PRICING page for current pricing.